Christopher Ludwick was a German-born American patriot with a big heart and a talent for baking. When cries of “Revolution!” began, Christopher was determined to help General George Washington and his hungry troops. Not with muskets or cannons, but with gingerbread! 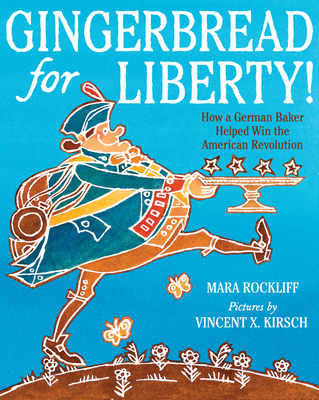 Cheerfully told by Mara Rockliff and brought to life by Vincent Kirsch’s inventive cut-paper illustrations, Gingerbread for Liberty is the story of an unsung hero of the Revolutionary War who changed the course of history one loaf at a time. "This appealing concoction is a powerful reminder of the good one person can do." * "A sweet addition to Revolutionary War units where a more behind-the-scenes look is desired and a nonfiction twist on gingerbread-themed storytimes." * "Rockliff’s story celebrates an unheralded historical figure, reinforces the value of creatively employing one’s skills, and reminds readers that heroes can be found in surprising places." * "Kirsch's cookie-cutter images of a battalion approaching by sea, hired by England's king, lessen the threat and sweeten the humor...[while] Rockliff uses recurring refrains for maximum impact...Readers will be back for seconds." "Kirsch's jovial cut-paper illustrations, in warm tones of ginger and cinnamon, complement the playful patriotism of Rockliff's text."